Grooming is the icing on the cake when it comes looking great, it brings everything together and is very important because it says a lot about you, even more than your clothes. 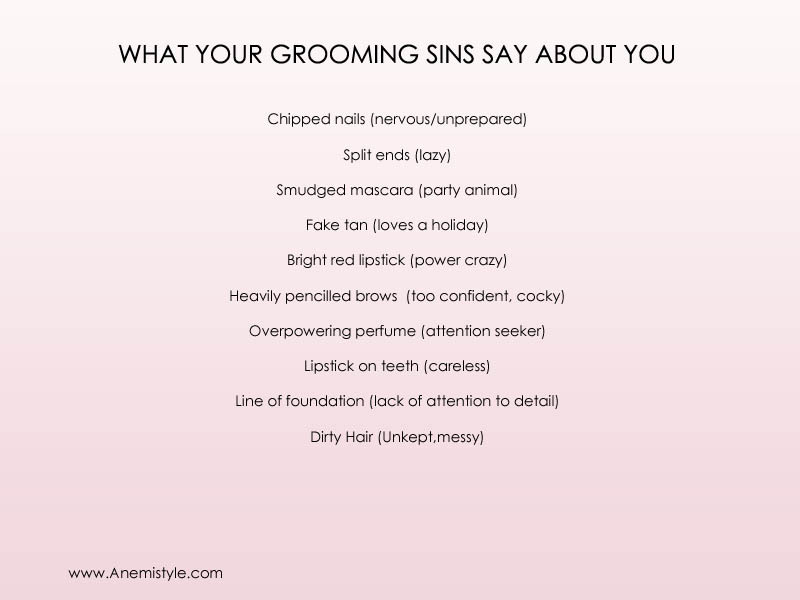 Dirty nails and body odour are more repulsive than wearing a jumper in the wrong colour or an ill fitting dress, grooming sins are less forgivable. They are very easy to miss as you might be so focused on deciding on what to wear that you forget your nails or something stuck in your teeth – gross! I read an article recently on how a lot of women looking for work with impressive educational achievements and great work experience are sabotaging their job search by making silly grooming mistakes. I remember being told off by my boss at for having chipped nails( it was a TV job), luckily I had a the bottle of nail polish and quickly fixed it. In a job interview or most business settings, bad impressions as a result of bad grooming are hard to correct and it is mandatory to avoid them at all costs. Making time and effort when it comes to grooming is pretty difficult because no one has the time to waste before work in the morning and you will most likely be tired and ready to hit the sack in the evenings. And because it is an ongoing process rather than a once in a while affair, I have put together some tips to help you avoid these sins and incorporate grooming into your daily life. 1. 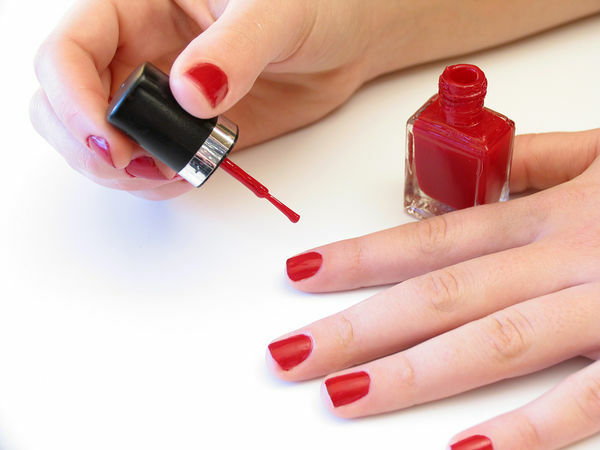 Watching your favourite soap in the evening is the perfect time to spruce up your nails, whether it is filing painting or just buffing, TV time is nail time. Try to keep your nail polish in your bag so you can touch up on the go if need be and always carry nail polish remover pads with you at all times. If you are on the go and you realise your nails are chipped beyond repair, you can easily clean that one off, believe me a bare nail is waaaay better than a chipped one. 2. A quick shave or epilate in the shower every once a week will probably add 5mins max to your shower time. Hairy armpits or legs cost a lot more. Most people focus only on their legs and armpits, I can't count how many times I have seen gorgeous looking girls with hairy arms, fingers, side burns and a moustache....hunny those are all no nos. Control your hair. 3. 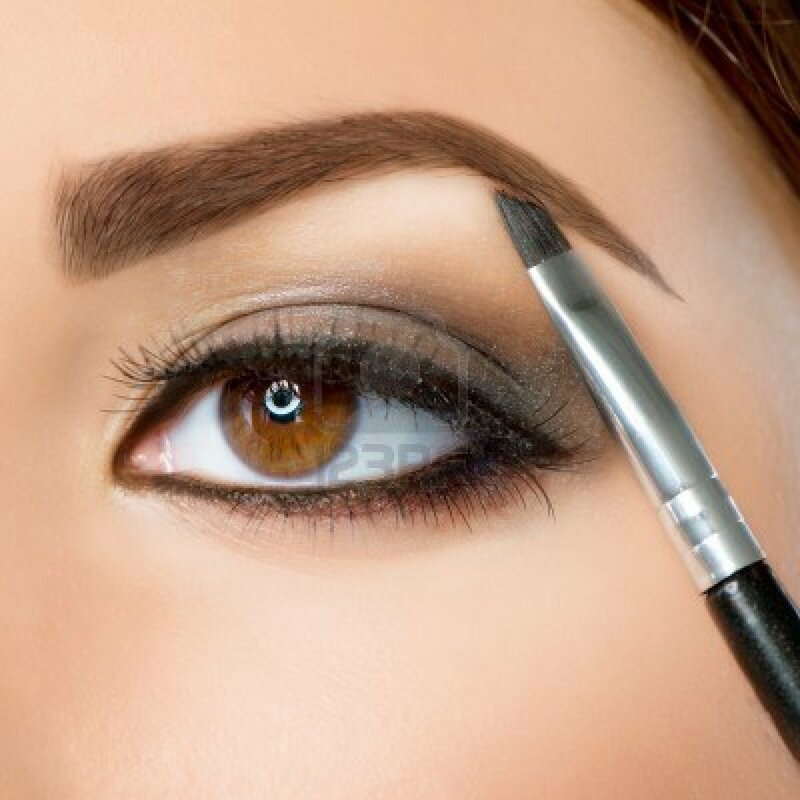 Tidy up your eyebrows once a week before bed, the redness will be gone by morning. Your eyebrows frame your face, so it is important to have them looking neat all the time. 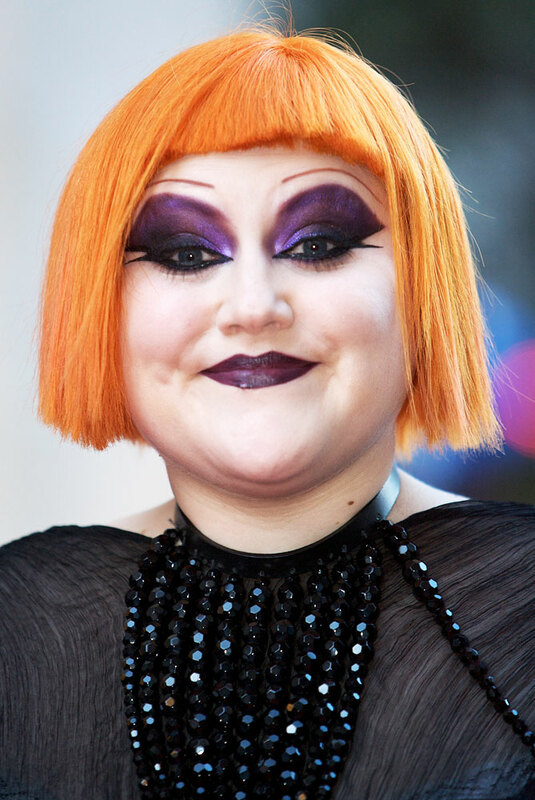 Also when filling them in try not to over do it, they should look as natural as possible, big blocky eyebrows or over plucked scanty brows are NOT cool. 4. 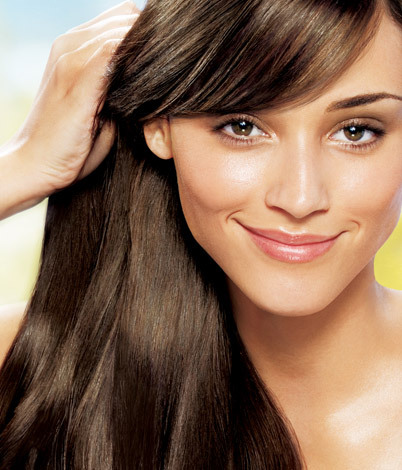 Wash greasy hair with a teaspoon of baking soda in your shampoo for a clarifying wash, and get your ends trimmed regularly for healthy and shiny hair. If you are in a rush use some dry shampoo, these days they make travel sizes and you can take them to work and top up if the need arises. 5. Get a signature fragrance. Try lots of different scents to find one that is very ‘you’, something that leaves a good impression when you meet someone but not overpowering. A great example is a vanilla or citrus based fragrance oil, soft soothing and sweet. 6. Perfect your fail-safe hairstyle, i.e. 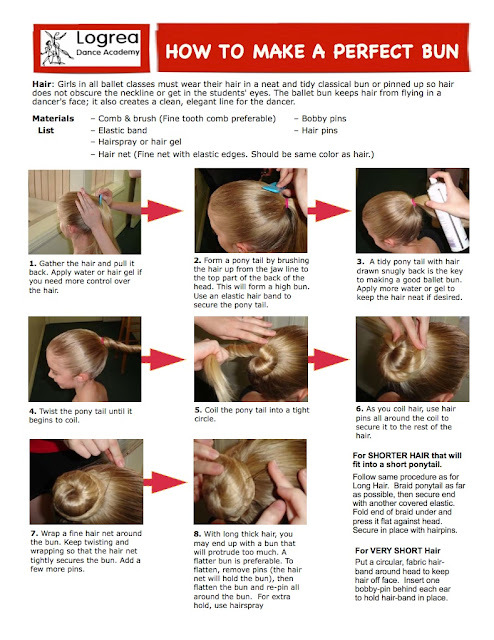 a simple hairstyle that you can do with minimum effort when you are in a rush. A bun is a perfect example, with either strong eyes or lips depending on your favourite feature. It will have you looking great with no effort. So far I have endeavoured not to go into specifics about what you should wear and how should wear your hair and makeup because everybody is different and your uniqueness makes you beautiful. Just remember the key is to refine it, stay modern and fresh to maximise your impact. Next week will be on developing your inner beauty, Audrey Hepburn said "The beauty of a woman is not in a facial mole, but true beauty in a Woman is reflected in her soul. It is the caring that she lovingly gives, the passion that she knows.” I will be discussing ways to develop that inner beauty that captivates, attracts and blesses people you come in contact with. Please subscribe for updates---------->. LOVE LOVE LOVE!!! You should be my new best friend, yes you should! Totes babe we have soooooo much in common its crazy! !